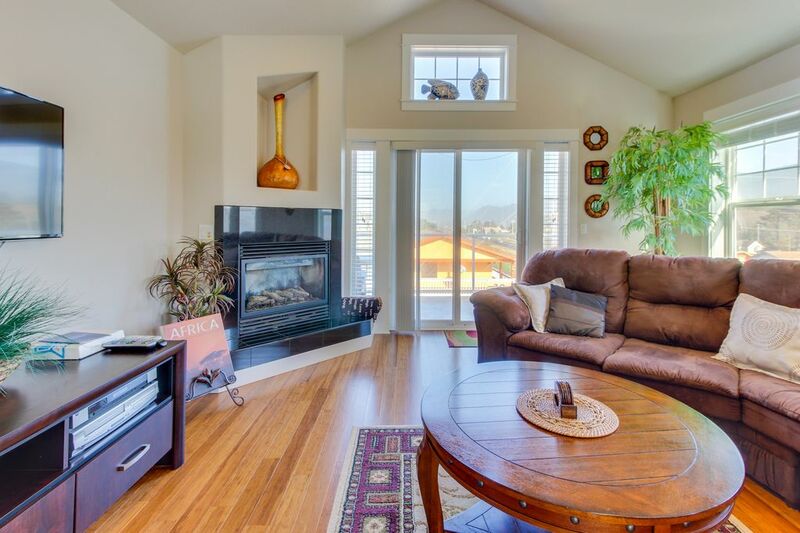 The sand and surf of Rockaway Beach are just down the street from this lovely two-bedroom townhome, where you'll enjoy access to two private balconies with ocean and mountain views. Built in 2006, this three-level townhouse is just steps from the seven-mile expanse of Rockaway Beach, and only blocks from restaurants, shops, and beach equipment rentals. You'll also find the charming town of Manzanita 12 miles north, the trails and bluffs of Oswald West State Park 16 miles north, and the ever-popular Tillamook Cheese Factory 13 miles south. With new carpets, refinished hardwood floors, and vibrant safari-themed furnishings, this 1,300-square-foot home is bright and modern. Large windows fill the living space with natural light, while the gas fireplace and a selection of board games ensure that you'll feel right at home. Looking to enjoy a quiet evening in after swimming, surfing, and sunbathing the day away? Scroll through the Netflix streaming options, browse the WiFi, or bring along your favorite DVD to watch on the 42-inch flatscreen cable TV. The full kitchen offers handsome granite countertops and stainless steel appliances, as well as a cozy breakfast table and bar counter with seating for four. And you can feel free to linger around the spacious dining room table as your iPhone plays in the sound dock—there's a dishwasher here to take care of the plates. Outside is a gas grill if you want hamburgers. Each morning, choose from a selection of toys and kites to bring down to the beach with your children; each evening, return home to relax, unwind, and enjoy a glass of Oregon wine on the scenic living room balcony. You'll also have access to a two-car garage and a private washer and dryer for any wet or salty beach clothes. Whether you're a whale-watcher, a swimmer, or a parent of young children, Rockaway Beach is a wonderful place to explore the beauties of the Northern Oregon Coast. Rent a kayak to launch on Lake Lytle, spend your days boogie boarding through the crisp waves, or hike to the breathtaking summit of nearby Neahkahnie Mountain in Oswald West State Park. The best of the Oregon Coast will be just outside your door—treat your friends and family to a Rockaway Beach getaway today! Close to everything we needed...right off the beach...warm and cozy. We traveled this April, to Rockaway for a celebration of life. Many family members gathered this weekend, from the east coast, as well as from Hawaii, which is where we traveled from. Not the best weather this particular weekend, but that's how it goes this time of year. We very much enjoyed our four day stay at the Safari Sagood...the location was perfect for us, in relation to all other family members here at beach Rockaway. Our place was clean, comfortable, welcoming, and all together a perfect fit for our needs. I loved the decor. Highly recommend. Thank you so much for taking the time to share your feedback following your stay. It sounds like it was the perfect property for you. Please come stay with us again soon! jessica B left a 5 star rating after their recent trip to Rockaway Beach, OR. I appreciated the clean and quiet townhouse--it was well equipped and close to the beach. Perfect for a peaceful getaway. It was a cute 3 story condo. Slept 6, 4 comfortably. Very clean. Beds were so comfy, we all slept great. Had all amenities needed, although I didn't see any coffee. We brought our own so it didn't matter. We were all sad to leave. Will be staying again. Highly recommend.